Way back in 1985, Microsoft launched Windows 1.0, the first version of its Mac-like software for PCs. In 2009, it introduced Windows 7, the current edition. Thanks to 24 years' worth of astounding advances in computing technology, the two products are worlds apart in look, feel and functionality. And yet, at their core, they're also surprisingly similar. They've both got windows, menus and dialogue boxes. Both are designed to be operated with a keyboard and a mouse. Every change that came along from 1985 to 2009 was evolutionary, not revolutionary. 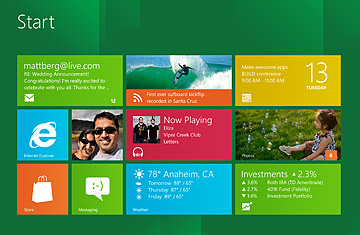 Then there's Windows 8, which Microsoft unveiled this week in Anaheim, Calif., at its Build conference. (Windows 8 is a working name; the final version could have a different moniker.) It sports a radically new interface that dispenses with windows, menus and dialogues, uses touch as its primary means of input and otherwise bulldozes multiple aspects of Windows that seemed to be sacred cows. For the first time ever, a new version of Windows is about departing from the past, not improving upon it. Developers need to know about Windows 8 right now so they can begin writing programs for it. Operating-system geeks can download a free preview version and try it out. But the teeming masses of consumers and businessfolk won't get their hands on the new system until it begins to ship in new PCs. Microsoft isn't talking about a shipping date yet, but mid- to late 2012 seems a safe bet. The test version of Windows 8 that Microsoft made available this week is missing wide swaths of features, and the Samsung "slate" PC that the company doled out to Build attendees is at best a rough draft of next year's Windows 8 tablets. It would be silly to form any definitive conclusions based on them. But it's not too early to see both promise and pitfalls. Windows 8's defining feature is its new user interface, Metro, which looks nothing like Windows 7, Apple's OS X Lion or anything else anyone's ever seen on a personal computer. It is, however, very much like a scaled-up version of the Metro that debuted last year on smart phones that run Windows Phone 7. (These handsets have barely made a ding in the market dominated by the Android and the iPhone, but Microsoft has garnered rave reviews for their software.) Metro is clean, attractive and intuitive  worthy competition for Apple's iOS as seen on the iPad without mindlessly mimicking anything about it. With Metro, nearly all of the clutter of Windows' traditional interface is gone, including the iconic Start button. In fact, when you're running an application, the app occupies the entire display, hiding the operating system altogether. (You can choose to squeeze two programs onscreen at once.) You launch apps from a start screen that represents them as oversize, widget-like tiles, each of which can preview information from the application in question, like snapshots from the photo app. Tiles can also represent people from your address book. More than any previous Windows version, Windows 8 will be hooked up directly to the Web. You'll be able to share items within Metro apps on Facebook, store stuff on Microsoft's Skydrive cloud-storage service and sync your settings across multiple Windows 8 PCs so they all become clones. Microsoft is also adding features designed to reduce the traditional pain of managing Windows, such as Refresh, an option that reinstalls the operating system without destroying your apps and settings. And in a move that should shock absolutely nobody, it's going to open its own Apple-style app store for Metro programs. Find out what you need to know about Windows 8.